In Nagai village of the Usuiki district of the province of Hyōga, on the 13th day of the previous month, there was a festival of Asumi shrine Akimi shrine. People of the village gathered and put on the usual village play, a kyogen, namely Chushingura. And in the 5th act a man called Seizo of this village came on stage playing [dressed as] Sadakuro. Everything [from head to tail] went well until the familiar incident called 50 ryō, when during this day's [today's] episode, while Seizo's older brother was there to watch and praise him as Sadakuro, the man playing Kanpei took out a hunting gun in his possession for some time, and as soon as he releases the flash lid with a click, Sadakuro was pierced by the shot, fell forward with a clump, and like that immediately died. As yet there are no reports as to whether Kanpei, saying he was sorry, has cut his belly or not. There must be something odd about the village theater. There ought not be a reward for shooting a boar like Seizo. People should awaken their enthusiasm for saying this is truly the extremity of sorrow. The story on the nishikie is almost verbatim the first half and closing line of the newspaper articles. Many elements of the narrative -- from the type of gun to the belly-cutting -- allude to developments in the drama (see below). The gun used in the drama was apparently a possession of the man who played Kanpei. Presumably he was a boar hunter and had left the musket primed and the punk burning. The picture, in addition to showing the boards of the stage, portrays the pine tree as a prop made of scrap paper backed by a wooden frame. province of Hyōga (日向国 Hiuga no kuni, Hyōga no kuni) is now part of Miyazaki prefecture on the island of Kyushu. The changing affiliations of Usuki district epitomize the volitile politics of the region, which became the stage for the Seinan War two years after the incident reported in this story. When domains were prefecturized in 1869, the Usuki district (臼杵郡 Usukigoori) of Hyōga became first part of Mimitsu prefecture, then part of Miyazaki prefecture, then part of Kagoshima prefecture, then in 1883 again part of Miyazaki prefecture. The district vanished when in 1884 it was split into Higashi Usuki county (東臼杵郡 Higashi Usuki gun) and Nishi Usuki county (西臼杵郡 Nishi Usuki gun) -- which continue to exist, though their many villages have been merged into a few towns. The location of Nagai village -- which seems to have disappeared NTL 1889 -- is not yet clear. Asumi shrine reflects 明見社 (tentatively "Asumi yashiro"), an as yet unidentified shrine. kyogen (狂言 kyōgen), a general term at the time for a kabuki play. Chushingura (忠臣蔵 Chūshingura), short, here, for Kanadehon Chushingura (仮名手本忠臣蔵). Acts 5 and 6 of this well-known play, which has numerous variations, goes very roughly like this. One night, in the rain, Kanpei, a boar hunter, meets Yagoro, who gives him fire for the punk of his musket. Yagoro also tells Kanpei about the vendetta. Kanpei wants to join but it will cost him 50 ryo. Kanpei has been living with Okaru and her parents. Unknown to Kanpei, she persuades her father, Yoichibei, to sell her to a brothel for 100 ryo so both Kanpei and Yochibei can join the vendetta. Yochibei goes to a brothel and the owner pays him half the 100 ryo up front. 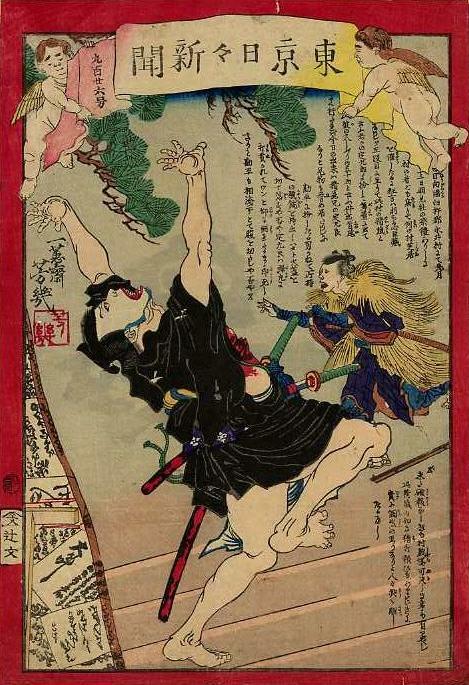 Sadakuro (定九郎 Sadakurō), who spots Yochibei, kills him and takes the money. A boar is running toward Sadakuro. Kanpei, who is hunting in the dark, shoots at something moving but finds he has hit a man. He cannot identify the man in the dark but takes his purse, which contains 50 ryo, and gives it to Yagoro. Kanbei returns to Okaru's house. Yochibei has not yet come back. The brothel owner comes for Okaru and gives her mother a purse with the other 50 ryo. Kanpei sees that that purse is like the one he took off the dead man. Some hunters bring Yochibei's body to the house. Kanbei refuses to look at it. Okaru's mother suspects that he has killed Yochibei. Yagoro comes to the house to return the 50 ryo Kanpei had given him. The purse has blood on it. Kanpei will not be allowed to join the vendetta because there are questions about where he got the money. Shocked by the discovery that Okaru has been sold to a brothel, and guilty about what he appears to have done, Kanpei rips open his belly with a sword. 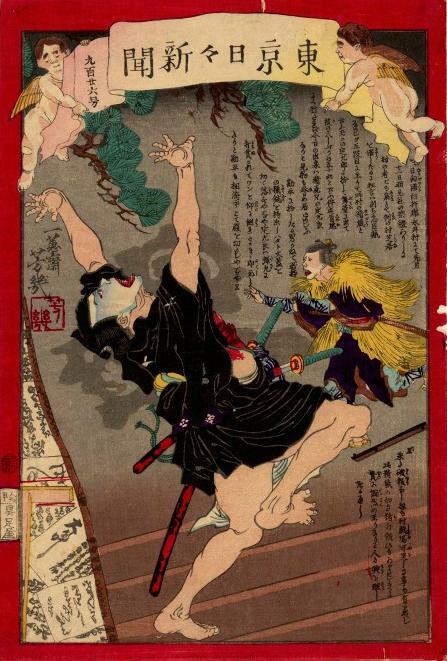 Yagoro examines Yochibei's body and finds he was killed by a sword. On the way there he had found Sadakuro, who had been killed by a gun. Yagoro concludes that Kanpei killed Sadakuro, thus avenging Yochibei's death. So Kanpei will be allowed to join the vendetta. After he impresses a bloody fingerprint on an oath, he dies. releases the flash lid reflects (火蓋を切て落す hibuta o kitte otosu) -- i.e., "fires" the gun. 火蓋を切る (hibuta o kiru) alone would have worked. The expression suggests that the gun was a matchlock gun (火縄銃 hinawajū, fire-cord gun), very likely of the Tanegashima (種子島) design, which used a snapping matchlock mechanism. Powder and shot (ball, slug, bullet) would have been loaded through the muzzle (火口 higuchi), and priming powder would have been put into the flash pan (火皿 hizara) at the firing end of barrel. The primer, when ignited, would burn through a touch hole and set off the charge of powder that, when it exploded in the barrel, propelled the shot. After the pan was primed, it would be closed by cocking (and locking) a spring-powered serpentine -- an S-shaped arm that held a match cord or "fire rope" (火縄 hinawa) or punk (wick). The cocking action both covered the pan with the "fire [flash pan] lid" (火蓋 hibuta) and positioned the punk over the lid. Releasing the serpentine, by pulling a trigger, opened the lid and and snapped the punk down on the exposed primer in the pan, thus firing the gun. The first firearms required the shooter to manually touch a match or burning cord to the powder. The matchlock was devised to touch the burning match cord to the powder without having to hold or look at the match cord -- the better to steady one's aim while eyeing the target and gripping the rifle with both hands. shot reflects 弾丸 (tama), which would be read "dangan" (in Sino-Japanese.